For this final challenge in the first series, we will focus on the area of Naturalistic Intelligence (good at appreciating the world and nature). I was ruminating...for a couple of weeks when I read the following article on July 14th. The question asked in the first few sentences in the article by Chris Berdik, "Should dolphins, great apes, and elephants be granted rights of their own? ", got me to thinking. 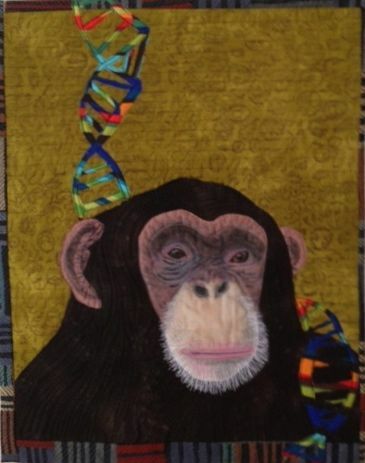 I have been periodically worried about the chimps aging in now underfunded and mostly forgotten science labs. I remember Dr. Sherer, a social anthropologist, lecturing about how man is differentiated from animals...one of those criteria was tool making. Really. I went to university that long ago. 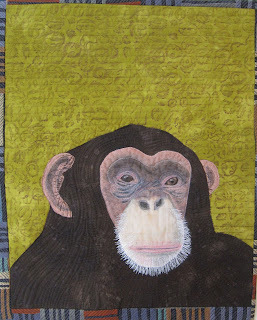 Who can look in the eyes of a chimp and not see an intelligent being? I decided to create a portrait of a chimp that reminded me of formal portraits (of important humans) progenitors, with a mottled background. In this case I created the background by rubbing over stabilized black walnut shells...working toward the title of "It's Just Nuts...Not to"
This is the way it stayed for a couple of weeks...more ruminating. Questions occurred to me....mostly about how alike are we to our anyway? How much DNA do we really share? Speaking of DNA...where on the DNA chain does "inalienable rights" get attached? Just when is that that we 'inherit' our rights to life, liberty and the pursuit of happiness? Hmmmm. He looks so wise, so calm. Would giving him "rights" make him as crazy as his human cousins? Would he feel he has to spend time, money and military might to defend those rights? What an intriguing fellow... he looks like he'd like to comment on your comments! Great, thoughtful piece, Diane! I love the portrait quality and the penetrating eyes.....what a tragic thought. I don't know that my comment would speak to historical practices, but I do know that the current trend is to have (very) close oversight on animal use (at least at major institutions) - and a follow-up plan for after completion of a study. Animal rights are complex, to say the least. Having looked into the eyes of a gorilla earlier this year, it is an amazing experience. Thanks for bringing this moment back for me. The DNA chain is so vital to the piece and message. Thank you all so much for your kind words...I had thought that when I started 'grooving' on "inalienable rights", I might get some eye-rolling. I am very much looking forward to this next rotation! This last one has been thought-provoking, educational, and very inspiring. I feel lucky to be included. Wow! The chimp looks so smart! I love his facial expression. Thank you for sharing this beautiful work with us!